If your preference is to remain at home rather than be forced with admission in a care facility, our team can definitely help. 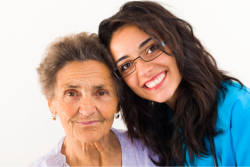 We enable the clients to receive the service they need to maintain their independence and dignity. Loyalty Home Health Care provides home care programs where we assist your loved one with day to day errands and in arranging transportation to and from medical appointments. …and other necessary appointments or activities. We take over your caregiving tasks so you will have peace of mind even when you’re away from your loved one.